The last decade has seen an exponential growth in farmers’ markets in the USA. Between 2007-2014, the number in America has grown by nearly 180% *. That’s great news for small farms! Farmers usually command their best prices at farmers’ markets. We’ve seen studies that show farmers make between 40% and 70% more for their produce than if they sold them through a wholesaler. And who doesn’t love a good farmers’ market? It’s good for communities and people when they can get closer to the way food is grown and shorten the path from farm to table. But there is even more money to be made at farmers markets if a farm can avoid some of the typical pitfalls many make in the process. The problem is that market vendors may not have a good account of the true costs of participating in their markets. 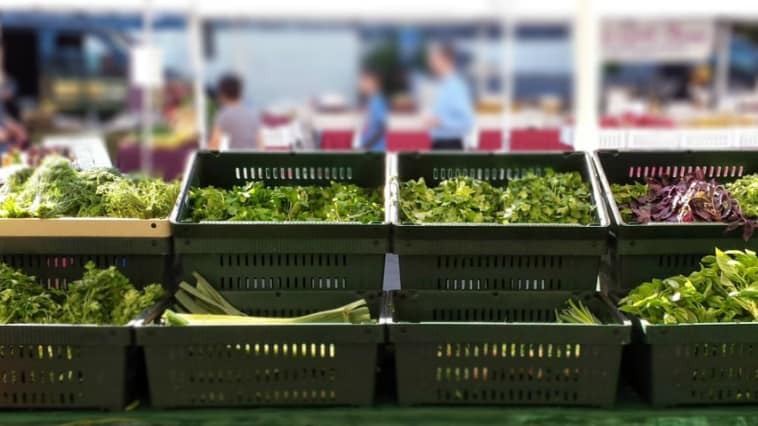 Farmers’ markets provide excellent venues for developing entrepreneurial marketing skills, giving important, real-world feedback on product variety, presentation, and profitability. Plus, they are a great way to connect directly with customers. One example is InterCrate customer Hidden Star Orchards. They produce apples, cherries,blueberries, pomegranates and grapes on 80 acres of land in the rolling foothills of the Sierra Nevada mountains near Jackson, California. They sell their produce along with jams, sauces and ciders to farmers markets throughout the San Francisco Bay area, so thinking about their business in terms of numbers is not new to them. The time it takes to harvest and the amount of spoilage they bring home are real concerns for them, especially because they are an all-organic, zero-waste operation. InterCrate works with them to get their harvest to market faster with totes that are easy to hold for harvest and translate well to a market display for sale. This all matters when labor, spoilage, and transport costs can eat away at the bottom line. When you take the time to measure your true profitability from a market, you can then implement strategies to improve it. Learn more about how Hidden Start Orchards builds profits with InterCrate totes in this usability study. Also, you can view InterCrate totes specially designed for Farm Markets.